Roof framing has undergone a quiet revolution over the past half century. 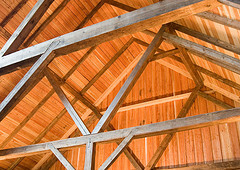 Trusses are gradually replacing the conventional rafters, to the point that nowadays more than 80 percent of new residential construction uses trusses to support the roof. Why has this change occurred and what are the advantages and disadvantages of rafters vs trusses? The traditional means of supporting a roof is rafters (otherwise known as "stick framing"), cut, built and installed on site by an expert carpenter. Rafters are made from sloped framing boards of dimensional lumber -- usually 2x8s or 2x10s -- connecting the roof peak, called the "ridge board," to the plates of the exterior walls. They are secured at the bottom by ceiling joists. Collar ties, placed horizontally halfway down the rafters, hold the rafters and roof planes together. While rafters are less and less frequently used today -- due to the higher cost of rafters vs trusses -- they do have certain advantages. Stick framing is flexible and may be altered without compromising the structure. As a result, you can create open space under the roof ... for good looks (as in the case of vaulted or cathedral ceilings), as well as practical purposes like building an extra bedroom, home office, or storage. It's also simpler to accommodate a home addition with rafter roofing. Though the actual installation is slower than for trusses, rafters require a shorter lead time to prepare. So if you're in a hurry, rafters will be the quicker way to go overall. They are also more suitable for remote locations, where transporting a pre-assembled truss system to the site would be too complicated, or for small roofs, when going through the process of site-specific truss design would not be cost-effective. Trusses are lightweight engineered units consisting of top and bottom "chords" supported by a webbing of lumber in a triangle shape. Because they're pre-made to your building specs offsite, often via automation like computer-driven saws, they are much faster and cheaper to install than rafters. Although they use smaller (and less pricey) pieces of lumber linked with tooth plate connectors, trusses are very strong and stable, capable of spanning great distances -- up to 60 feet. This reduces the need for interior load-bearing walls and allows for a more open floor plan, in tune with today's trends, on the lower stories. Another plus offered by truss framing is that it saves an important natural resource by utilizing smaller amounts of lumber and producing less wood waste. However, truss systems do come with some distinct disadvantages. A prebuilt truss system is heavy to transport and lift into place. You are likely to need an 18-wheeler and a crane -- together with adequate road access -- for the job. The webbing which supports the chords tends to impinge on the space directly underneath, a pronounced disadvantage if you would like to convert your attic or the area above the garage into usable living space. Scissor trusses allow for somewhat of a cathedral ceiling, unlike other styles such as cambered trusses. Once a truss system has been installed, it will be difficult and even dangerous to try to modify it. Cutting any part of the webbing or even drilling a hole to accommodate electric wiring can undermine your truss roof's integrity. You'll need to consult a professional building engineer if you must make alterations. In addition, the National Fire Protection Association has raised concerns about the fire safety of truss-framed roofing made of engineered wood. Contact an experienced carpenter to discuss rafters vs trusses for your home.